We know that the pig in your life is special. That's why Porkers is more than just a beauty salon. At Porkers, your porcine pet can enjoy a haven of tranquillity in which to relax and unwind from the day-to-day pressures of life in the sty. Set in fifteen acres of stunning countryside, our retreat offers everything your pig could desire to harmonise its inner being, rejuvenate its natural energies and journey along the road to wellbeing. With luxurious air conditioned rooms, twenty-four hour saunas and en suite mud baths, your pet will think it's died and gone to piggy heaven! There's no pressure, no regime - life is easy at Porkers, where everything is geared to your pig's comfort and enjoyment. 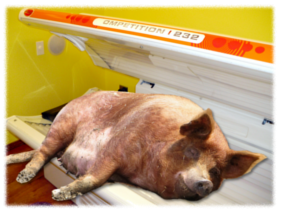 Whether it's relaxing in the sun lounge, stretching those tired muscles in the hydrotherapy centre or taking advantage of our premium spray tanning room, Porkers has got everything that the modern executive pig could ever need. Ring now for a brochure and get a free spatula! Porkers is a trading style of E.F. Sweeny's Premium Meats Ltd. Quality products from a quality butcher.